The iron deficiency anaemia has resolved. A ferritin was checked (although not technically necessary) and it was reassuringly well within the normal range indicating adequate iron stores. Our patient is well with a normal blood pressure, no proteinuria, unremarkable blood film and normal renal and liver function. Her HIV and hepatis B/C testing at booking was negative. Apart from iron she is on no medications. She has had a normal platelet count in the past. We are happy she does not have pre-eclampsia, HELLP or other serious disorders. 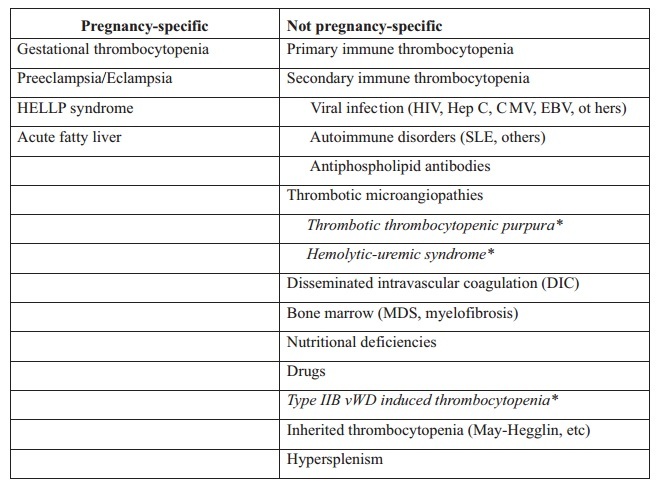 The differential lies between ITP and gestational thrombocytopenia. We decide to check her platelet count on a weekly basis until term. How can you tell the difference between ITP and gestational thrombocytopenia? How do you manage delivery – both for baby and mother with a platelet count at this level? Please reply to us (@TeamHaem) on Twitter and always include #TeamHaem to allow others to follow your comments. Please join in the debate and learn about haematological problems along the way. The case will continue to evolve over the coming week so keep checking #TeamHaem on Twitter for more information. Please note – all cases on TeamHaem are entirely fictional to protect patient confidentiality. TeamHaem are not a position of authority. It is an educational platform to allow discussion and learning. This entry was posted in Anaemia, Platelet disorders, Related to other specialities and tagged anaemia, haemoglobinopathy, iron deficiency, pregnancy, thrombocytopenia. Bookmark the permalink.